We all deserve to be able to enjoy the shade in our garden or yard. One of the best looking and effective ways to beat the heat is also one of the most unique. 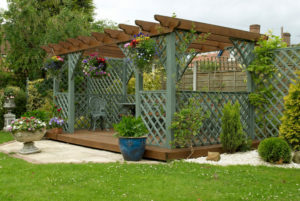 The pergola has been around since ancient times and is just as popular as it was back then as it is today. These outdoor structures are a little different than your standard options. First of all pergolas have a square or rectangular roof that isn’t solid. It is actually made up of slats instead. And while you might think that this wouldn’t block out the sun’s rays nothing could be further from the truth. That’s because the sun’s position changes in the sky throughout the day. There are also no walls to block your view and this allows for cool breezes which is always a plus. When considering one for your outdoor space you’ll need to pick a material. Wooden choices are always charming and many even have that distinct wood smell to add to their natural feel. A metal pergola is a great option if you are looking for serious strength and something a little more modern. Vinyl pergolas are actually the cheapest and one of the top-selling materials not only because of their low cost but the fact that they don’t ever need any maintenance at all. There are many other things to think about as well. If you are handy you might want to think about doing the job yourself and there are many sets of plans and quite a few books available online that teach you how to build a pergola by purchasing your own supplies locally. Usually this means from wood. There are also many pergola kits available today which come with everything you need. These just require a few hours and at least two people to put them together and can be much cheaper than paying someone to design and build a structure for you. Styles are also something to consider too as there are many to pick from. While some look more Asian others are more Mediterranean. A pergola is without a doubt a fun and effective way to get out of the summer sun. Just be sure to take your time choose the style and material that you prefer most and whether or not you want to build it yourself, pay someone else to do so, or desire a kit. And most importantly when it’s up and providing you with shade, be sure to deck it out with your favorite pieces of furniture whether that means some simple and attractive deck chairs or an expensive and ornate metal bench. This entry was posted in Yard and Garden and tagged Build a Pergola, Metal Pergola, Outdoor Space, Outdoor Structures, Pergola, Pergola Kits, Pergolas, vinyl pergolas. Bookmark the permalink.